The next step in our trip up the Oregon Coast was from Yachats to Depoe Bay. This was not a very long distance to cover at all. We really wanted to stay in Depoe Bay, however, for two reasons. The first is that we got to stay at the Whales Rendezvous B&B, which has this amazing view and where the owners seemed really friendly and helpful. 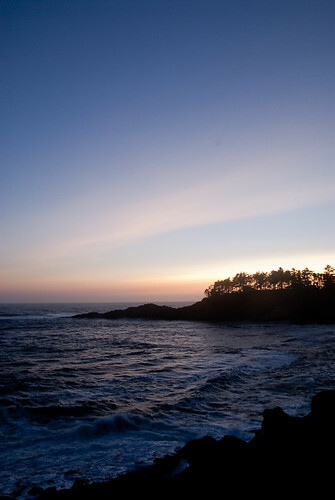 Also, Depoe Bay is a nice little sheltered bit of water – it’s almost like a really big cove more than anything else. The water can crash, it can be smooth, and whales do actually come through there on a regular basis. They even come right into the bay during certain times of year (not when we were there, sadly). The sunset, we knew, would be amazing from the deck at the B&B. We started the day off in Yachats, with a breakfast at the Green Salmon in Yachats. This is an all-organic, all recycled, “green” diner-ish place that even powers its register and stereo via solar panels charging batteries. Kind of cool. But, bottom line, the food is good, too. We had an egg & sausage sandwich, and a green tea cream cheese (yes, the cream cheese was green), tomato and lox bagel. I think we had this really nice rose tea for a drink as well which was very nice. A very good way to start the day. We made several small stops along the way, including at Seal Rock and I think along the bridge in Waldport (the next photo, but it’s missing GPS info so I’m not sure – it might be the bridge in Newport). Technically, the photo of the covered bridge by Yachats was done on this day, as well, as both it and a very nice but out of the way park are off the highway and weren’t right for the end of the trip the previous day. We did some nice IR work in the park, I think. It was quite a drive to and from the park, I will say, but it was quiet and very pretty. The funny and surprising part was that after driving a ways down a small paved road, then onto a rough paved road, then onto a dirt road…we ended up at the trail head with a couple of minivans from two families that picnic there “all the time.” Seems rather out of the way for such a frequent event but it is a nice place. Newport was definitely the major stop along the way up. 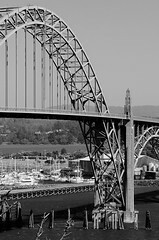 Not only might the bridge photo above be from there, but there is also the Yaquina Bay Lighthouse. 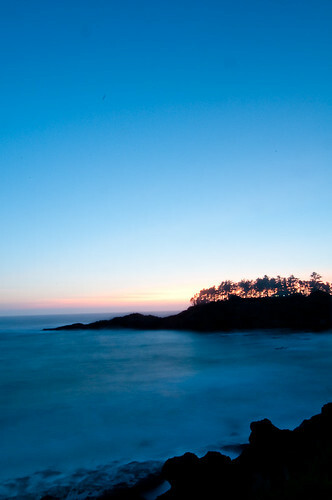 This is different than the Yaquina Head light, which I visitied and photographed on my own the next day. The Yaquina Bay one is much more like many that I’ve seen on the west coast – it’s a house with a light on top, rather than a tall, somewhat free-standing light with the keeper’s house separate. This particular lighthouse was originally intended for Cape Foulweather but ended up here instead. What was not clear was whether it ended up here because the Cape’s Foulweather was…too foul, or if the lighthouse was/is even used, considering it’s fairly far in from the actual coast. Rather hard to photograph, but still interesting. Worked quite well in IR, too. Depoe Bay was next, along with an excellent dinner at Tidal Raves – the owners of Whales Rendezvous made the reservation for us, after running out to meet us and help us park the car (yes, they are that nice and accommodating). Other than some photos of the spouting horn, a carve-out in the rock that produces these gushers of water, the sunset was the key. And it was worth it.